If you’ve never considered a visit to Iran, then we think this first-hand account will change your mind. Here’s the inside scoop on why you should make plans to go to this very special country. It’s a big mistake to consider that life in Iran is hard and, perhaps, even a drudge. You forget all about stereotypes when you see real life there. As it’s very hot in summer people gather in parks and on the streets after sunset. They spend time with their friends on green lawns, have a picnic right there in the centre of the city and enjoy life. Of course, there are certain restrictions in place in accordance with the teachings of the Muslim religion. But it’s amazing how beautiful their women are despite the strict dress code. They are so elegant and stylish in their conservative clothes and shawls. It looks so natural and feminine when they tuck a loose strand of hair under their scarf. You’ll learn about the way of life here almost without noticing. In your hotel bathroom, you’ll find rubber slippers, for instance, and later find out how to Muslims, the bathroom is considered unclean, somewhere you’d never enter barefoot as we might in the west. Iran’s beauty isn’t confined to its people. Nature really puts on a show here. Rocky sand-coloured mountains rise above the plain. Flocks of black and brown sheep graze; herds of horses kick up the dust. Ochre cubes in the distance reveal themselves on closer inspection to be simple dwellings. The colours are bright; under Iran’s cloudless blue skies they seem more vivid than in Europe. As you drive north, the landscape greens up, with bushes and trees scattered liberally beyond the roadside as far as the eye can see. In the East Azerbaijan province, cliff dwellings are still inhabited and you can even stay in a hotel built right into the rock. If you travel in summer, pay particular attention when you reach Isfahan. The big river that crosses the city is totally dry and people cross it just walking the cracked brown silt of the river bed. As the summer is very hot people generally use river water for irrigation so the best time to see rivers flowing is spring (April) - that is the best time for travelling. Cultural attractions abound and religion is part of everyday life. Look on the floor: if you notice a small arrow, it indicates where the Kaaba is, so that Muslims know which direction they should face when it’s time to pray. Ancient mosques, palaces and mansions have been transformed into hotels with an abundance of mosaics, paintings, mirror tiles, patterns and ornaments that wow guests with their striking beauty. The domes of mosques bearing neat patterns and harmonious combinations of colours are breathtaking in their simplicity. Take a moment to meditate and reflect. Food is almost an art form too. You’ll want to note down these new recipes, buy spices and delicious pistachios and almonds from the market. Things are done a little differently: cucumber’s considered a fruit. Don’t forget to try their unique saffron syrup and of course rose water. Iranians are so happy to show and to share what they have. 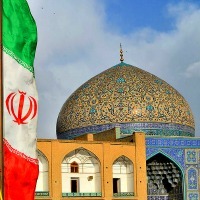 Iran with its diversity, uniqueness, rich cultural heritage and hospitality has so far been overlooked as a mainstream tourist destination. Yet every person who visits this country understands how often we miss a real jewel because of stereotypes and inaccurate media perceptions. Iran is a marvellous country with its own ways and traditions. Some of its peculiarities differ greatly from western ways of life. So if you’re planning to visit this country, it’s wise to know how to conduct yourself in accordance with cultural and religious norms. Females visiting Iran should remember to cover up when in a public place out of respect for Muslim teachings. You’ll hear the poetic phrase “cover her beauty”. A woman must cover her elbows and ankles. Also her clothes can’t be tight. That’s not to say you have to swamp your figure and go out dressed like a bag lady. Look to the locals: it’s perfectly acceptable to wear tight jeans but cover up with a casual tunic or long, boho cardigan. It’s absolutely possible to follow these rules and be stylish and attractive. It’s not necessary to cover the face and though a scarf should be worn, it can just slightly cover the hair. As for shoes there are no restrictions in style. However, Muslims believe that you should wear shoes in a dirty place and go barefoot in a “clean” (saintly) place. Each time you visit a mosque you will have to take off your shoes. It’s good to know this in advance as there are a great number of mosques and it’s a great deal more convenient if you’ve chosen slip-ons! Alcohol is prohibited. You will not find it anywhere. It’s not possible to find it in shops or in restaurants at all. In fact, you should be ready to discover that during your stay there, the only mention of it will be in the amazing Hafiz poems. Embrace the detox! The old adage, never talk about religion and politics, holds true here. Iranians are very hospitable, kind and happy to see tourists from all over the world. But as everywhere else, it’s possible that you will encounter some who have an extreme point of view when it comes to politics. It’s best not to allow yourself to be drawn into conversation in such circumstances. With all the incredible things you’ll see, it’s not like you’ll be short of other things to talk about. It’s only possible to pay in local currency – the Iranian rial. It’s better not to exchange USD or Euros at the airport. Your guide will show you where you’ll get a better exchange rate. Also it’s not a problem to pay by card.